As of Monday, April 1, the Florida-based fast food chain Burger King has introduced a new menu item in 59 of their stores in the St. Louis, Missouri, area. The item has been dubbed the “Impossible Whopper” because it uses a meatless patty instead of a traditional ground beef patty. The meatless burger is being supplied by Impossible Foods, a plant-based protein company from Silicon Valley. The burger is made of water, wheat protein, coconut oil, potato protein, binding agents and heme. Heme, or leghemoglobin, is a protein found in almost all animals and plants, and is said to give meat its “meaty” flavor. Instead of extracting this protein from animals, Impossible Foods sources it from the roots of a soy plant. The heme is then introduced to genetically modified yeast, which is fermented and introduced to the rest of the ingredients. 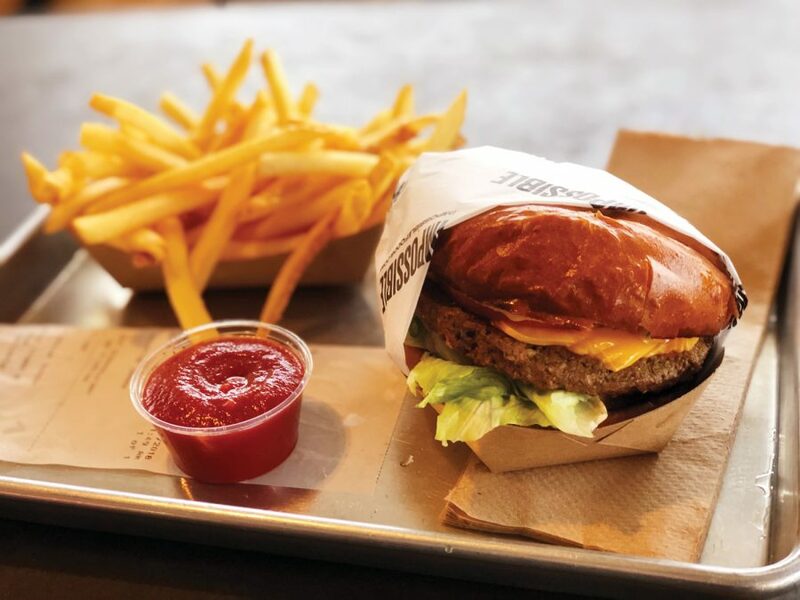 Impossible Foods has been on the rise, as companies such as White Castle and Red Robin have begun to adopt Impossible Burgers in some of their stores. But when Impossible adds Burger King to its list, it will finally put its meatless meat in the hands of the elite fast-food chains. The company decided to test out the Impossible Burger after some of its employees were unable to differentiate the Impossible Whopper from the meat Whopper in a taste test. Even though the two burgers taste the same, Impossible claims that its burger has 15% less fat and 90% less cholesterol than the one with meat. With the benefits of the Impossible Whopper, Burger King’s menu will reduce its dependence on the meat industry, a major contributor of greenhouse gases. Since relying on the second level of the food chain for one’s diet is inefficient, a more efficient plant-based product that replicates the taste of meat and stays on the lowest level might be the future of the meat industry, and Burger King is willing to invest. Depending on how well the trial in Missouri goes, Burger King could be adding the Impossible Burger to the menus of over 7,000 Burger Kings around the country, according to Impossible’s Chief Executive Patrick Brown. GMO’s and coconut oil which has saturated fats? Hmmmm, not sure it is too healthy.